Variance Hammer turned two awhile back, and as I did last year, I’m going to indulge in a little introspection. This allows for the opportunity to talk about where people are finding this site from, what they’re reading, etc., which is I think interesting both from the perspective of the health of this blog, and also if folks are interested in starting their own site will give some perspective on what it’s like. One note, as someone brought up last year – all of this is based on WordPress-derived data. So visitors are visitors to the website. If you read Variance Hammer through an RSS feed or email subscription, that’s not captured in this (but I still sincerely love you all). I’m also looking at things for the entire lifetime of the blog, not just this year, so some things that happened last year are still included. I’m an academic by profession, so part of me is more than familiar with the concept of “My ideas are worth writing about, even if no one reads them!” And in certain cases, this is true. 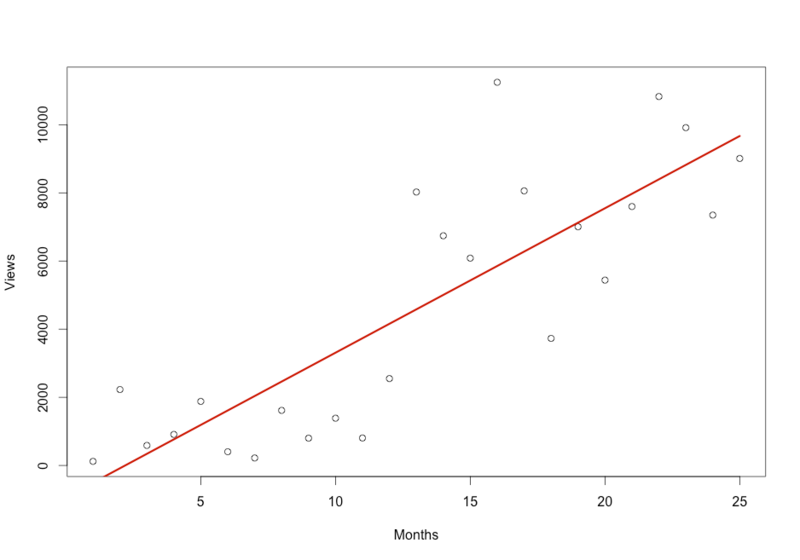 In the case of Variance Hammer, it isn’t – I want this to be read, discussed, etc. It’s very hard to be motivated to keep writing if you think it’s just going off into the void. What ended up really kicking Variance Hammer into high gear (such as it is) was a reader reaching out to me. So…where do you all come from? The big switch this year is search engine traffic dramatically overtaking Reddit, despite Reddit still being the primary active way I publicize posts. This has been driven by a few timely and well positioned reviews that have raised Variance Hammer’s search engine visibility – but as with last year, this traffic is very much concentrated on the reviews, rather than analysis, posts. Which is nice – I’d like to think that means we’re reaching a larger audience. 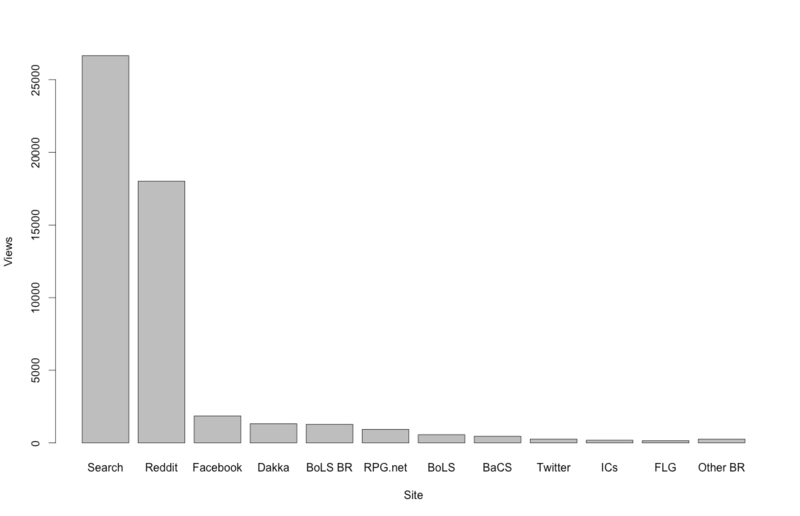 While in “Second Place”, Reddit is still a major source of traffic for this site. It’s nice to see Facebook on there as well – Variance Hammer has a fairly modest Facebook page, and occasionally appears elsewhere. The Bell of Lost Souls blog roll continues to be a source of low but steady traffic. Other sites are very hit-and-miss. For example, DakkaDakka’s appearance here is the result of a single thread someone else posted. Awesome when it happens, but not terribly reliable. Again, the balance comes from other sites. Frontline Gaming, Twitter, the Independent Characters. These aren’t major sources of traffic, but they’ve all been really good for engagement and opportunities to interact with people. Ironically, I’d say these three, while low traffic, have yielded the most “cool opportunities”. So we’ve talked about my traffic – do I generate traffic for other people? By far the bulk of my outgoing traffic (ignoring things like “I clicked on a picture and technically WordPress’s content management server is a different site) is Frontline Gaming, driven by my review of the F.A.T. Mat (still blissfully happy with mine). Following that were visitors to The Independent Characters, Cadian Shock, Secret Weapon Miniatures, etc. The number of you who now know how to pronounce “Tripartite” is up to 79. The GitHub repository (ignoring the Doom of Mymeara FAQ, which has a lot of independent traffic) remains a niche interest, but one that people visit enough to make continuing to post code worthwhile. The code underlying a lot of the analysis I do is in for a serious re-write soon (I’ve thought of a new way of representing things that should make melee combat especially so much easier). 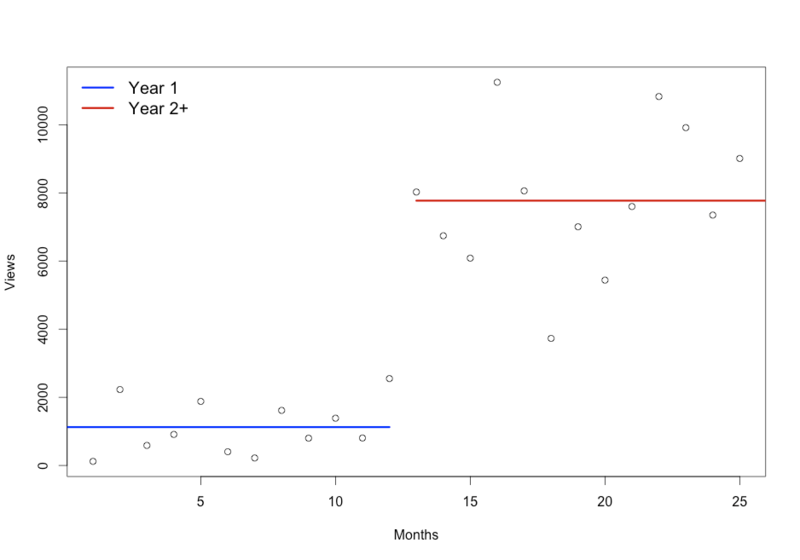 Here, I’ve plotted the average views of the first 12 months, followed by the average visits for the views since then. I think this tells a much more accurate story – I got serious about writing Variance Hammer, we got some steady search engine traffic, and our views markedly rose. But they’re also fairly stable – I believe Variance Hammer may have reached something of the peak of what I, as a single individual, can create, as most of the posts on the site get the vast majority of their traffic within the first day or two of posting. There’s a finite amount I can write, and thus there’s a finite amount of traffic the site generates. That’s not necessarily a bad thing, as long as this too can be sustained. The most popular posts on this site, by views? Note this hasn’t controlled for the time these posts have had to accrue their views – #2 and #3 on that list especially have been getting traffic for a long time, while the Death from the Skies review is brand new. There are ways to control for that, but honestly? They’re too much work in WordPress’s interface. The Eldar Codex Mega-review racked up 14,093 views, making it the most popular series I’ve done, but it also got spread over a tremendous number of posts. The most popular single day on Variance Hammer involved 1823 views, most of them for “Breaking Down the New Wraithknights”. This is also the day I ended up having to upgrade Variance Hammer’s hosting plan. Nerf Wraithknights. And a huge shoutout to Paul Murphy of Forge the Narrative for asking the original question. Tournament talk generates comments. A full 60% of the top ten most commented posts involve the competitive scene in one way or another – which isn’t surprising, as these are also some of my more combative posts. I’m immensely grateful for the support I got running the Feast of Fluff contest, from our sponsors, the community, etc. The entries were great, and I’m seriously considering running something similar next year. If people have other types of contests they’d like to see, please do let me know. How’s The Patreon Campaign Doing? First, I’d like to thank Variance Hammer’s patrons – there support has been incredible, both financially and in terms of their comments, feedback, etc. It was also tremendously useful when the site needed its hosting upgraded for that not to be a thing. Now, does Variance Hammer make money? Not even close. Even ignoring time (which is not a small thing), I buy books, software, etc. that I’d probably skip if I wasn’t running this site. It helps defray those costs, etc. but at best, Variance Hammer isn’t burning a hole in my pocket. And that’s okay. As Carl from The Independent Characters (whose podcast is at least two orders of magnitude more successful) put it, you don’t get into this for the money. This is an aspect of my hobby. It’s impossible to really expect that to turn a profit – especially without turning your site into a click-bait heavy, ad-laden monstrosity. So even if we didn’t have any patrons, I would still do this – but they do help immensely. We’ve had six patrons total (but always five patrons at any one time – we gained and lost on the same month), which compared to the number of people who have clicked one of the Patreon links at the bottom of many posts, that’s a 2.3% conversion rate. 1.1% if I include only those patrons I know weren’t recruited by other means. That’s not bad when it comes down to it, especially since it’s purely a show of support – I haven’t been doing patron-exclusive anything (save for sending out some dice) and my intent is for all of Variance Hammer’s content to remain free and accessible to everyone. I’m going to keep trying to put out decent, worthwhile content, and keep the mix of analysis and opinion balanced. I’ll admit I’ve had some distractions of late: a new job, an adopted dog, and a number of video games have meant an overall decrease in “hobby time”, including writing time. A weird error with iBooks also got in the way of writing some reviews by locking me out of content – always an issue with “The Cloud”. But I’ve got some ideas for posts set up, and a few “major projects” I’m looking forward to revealing in the new year. Thank you all for reading Variance Hammer. I’m very much looking forward to another year. Great to see the site doing well. It’s the only 40k blog I follow closely. One suggestion that might boost a few more internal pageviews (i.e., not more visitors, but visitors spending more time/pages) would be some sort of home page and/or sidebar highlighting all of the great content that is here. Right now when you follow a link to a post, you get that page but no real indication of everything else here. There’s also no way to browse the posts by content rather than just going back chronologically. So I can’t, e.g., come in by searching for reviews of FAT Mats and then say “Oh, I’m interested in a Wulfen review too” and click away. The left sidebar is populated by a widget showing icons for the last couple posts I’ve tag “featured.” The content directory on the landing page is driven by a plugin that enables markup for lists or icon views for given tags, so then I just have a bunch of markup using it to show “featured-design”, “featured-apocalypse”, etc.. The icons themselves are managed by a plugin that adds a control to the posts list in the dashboard. Those images are also then published as the og:image for the page, which Facebook, Reddit, etc., take to populate their share previews. My gaming blog is only in the mid-ground between Variance Year 1 and 2, I think in part because it’s less focused and not tactics/list/competition analysis oriented. So take that suggestion with a grain of salt. But I think it’s a good idea. I personally also like having that landing page, both just to see everything laid out and get that personal satisfaction from having created something, and also to quickly get links to the things I reference often in other writings or forums. I’ve been pondering something exactly like that – I think I’m going to expand out the tabs at the top of the page to collect some of the more influential posts. I just come to the site once every couple days to look and see if there are new posts. Is traffic like that (“direct”?) represented somewhere in your stats? I suppose I don’t have any reason to think that I am typical, but it is possible that it might be a lot of traffic? I agree with the other suggestion. There seems to be a lot of space in the sidebar (at least as you scroll down while reading the page). Though maybe a lot of people read on their phones and would not see the sidebar. I don’t know. Anyway, I’m also writing to mention that I appreciate the analysis posts, even though I don’t tend to make comments and possibly may not show up in the stats due to lack of an http referer [sic]. Yes, traffic like that will show up in the stats. It doesn’t show up as a referral, but it does show up in total views. On a mobile device (I just checked this on my iPhone), the sidebar gets dumped to the bottom of the page, so it won’t get in the way of content. Next Post: What’s Wrong With The Tau?